The Healing High Flyers delivered workshops to more than 60 pupils ranging from age three to 18 at the Humberston school. They taught chants and put energetic dance routines to music. 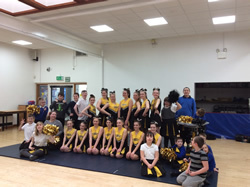 Humberston Park’s pupils were excited to wear the cheerleading uniforms and loved shaking the pom-poms to the beat. The cheerleading squad has been “incredibly committed” to their training schedule and has been working hard to master their latest complicated routine. Mrs Yeadon and Mrs Plant were proud of the girls. “They are excellent advocates of Healing School and a credit to themselves,” Mrs Yeadon said. Associate Principal of Healing School, Mrs Dewland, also praised the squad. “I’d like to thank Humberston Park for the invitation and hosting our cheerleaders,” she said. The Healing School ‘High Flyers’ cheerleading team, who delivered a workshop to pupils of Humberston Park School.